Migration watch; 06.00 - 09.45hrs and 17.55 - 19.00hrs. Although coverage was at its lowest for some time it was still evident that new migrants had arrived. 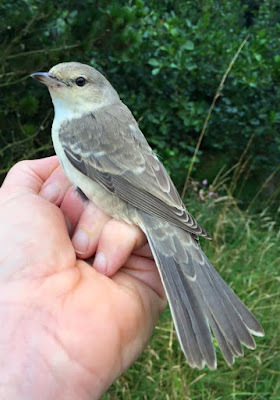 A BARRED WARBLER was the highlight, trapped and ringed at Long Nab while in the area were singles of Common Sandpiper and Kingfisher, 3 Lesser Whitethroat, 2 Blackcap, 3 Chiffchaff, 3 Willow Warbler, 1 Spotted Flycatcher and 2 Pied Flycatcher. On the move there (south unless stated) were 2 Oystercatcher, 3 Ringed Plover, 1 Golden Plover, 1 Whimbrel, 8 Black-headed Gull north, 1 Common Gull, 1 Sandwich Tern, 2 Common Tern, 1 Tree Pipit, 5 Siskin, 3 Linnet and 1 Crossbill. Elsewhere 9 Teal and a Common Sandpiper were in Cornelian Bay where there were also 60 House Martin and 12 Swift, a Little Egret, 1 Common Sandpiper and a Wheatear were seen at Wykeham South Lake, 110 Common Tern were at Scalby Mills, a Little Egret, a Redshank, a Common Sandpiper and 3 Green Sandpiper were on Johnson's Marsh and a Redstart was seen on Castle Hill.